The aim was to compile the current knowledge about the efficacy of different soft tissue correction methods around osseointegrated, already uncovered and/or loaded (OU/L) implants with insufficient soft tissue conditions. Procedures to increase peri-implant keratinized mucosa (KM) width and/or soft tissue volume were considered. Screening of two databases: MEDLINE (PubMed) and EMBASE (OVID), and manual search of articles were performed. Human studies reporting on soft tissue augmentation/correction methods around OU/L implants up to June 30, 2016, were considered. Quality assessment of selected full-text articles to weight risk of bias was performed using the Cochrane collaboration’s tool. Overall, four randomized controlled trials (risk of bias = high/low) and five prospective studies (risk of bias = high) were included. Depending on the surgical techniques and graft materials, the enlargement of keratinized tissue (KT) ranged between 1.15 ± 0.81 and 2.57 ± 0.50 mm. The apically positioned partial thickness flap (APPTF), in combination with a free gingival graft (FGG), a subepithelial connective tissue graft (SCTG), or a xenogeneic graft material (XCM) were most effective. A coronally advanced flap (CAF) combined with SCTG in three, combined with allogenic graft materials (AMDA) in one, and a split thickness flap (STF) combined with SCTG in another study showed mean soft tissue recession coverage rates from 28 to 96.3 %. 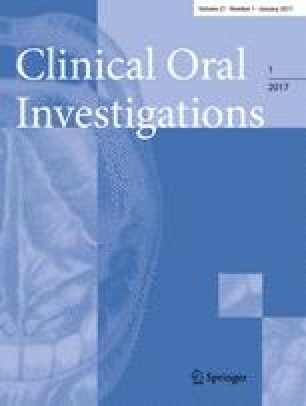 STF combined with XCM failed to improve peri-implant soft tissue coverage. The three APPTF-techniques combined with FGG, SCTG, or XCM achieved comparable enlargements of peri-implant KT. Further, both STF and CAF, both in combination with SCTG, are equivalent regarding recession coverage rates. STF + XCM and CAF + AMDA did not reach significant coverage. In case of soft tissue deficiency around OU/L dental implants, the selection of both an appropriate surgical technique and a suitable soft tissue graft material is of utmost clinical relevance. Renzo Bassetti declares that he has no conflict of interest. Alexandra Stähli declares that she has no conflict of interest. Mario Bassetti declares that he has no conflict of interest. Anton Sculean declares that he has no conflict of interest. This review article was supported by the authors’ own institutions (Department of Oral and Maxillofacial Surgery of the Lucerne Cantonal Hospital and Department of Periodontology of the University of Bern, Switzerland.